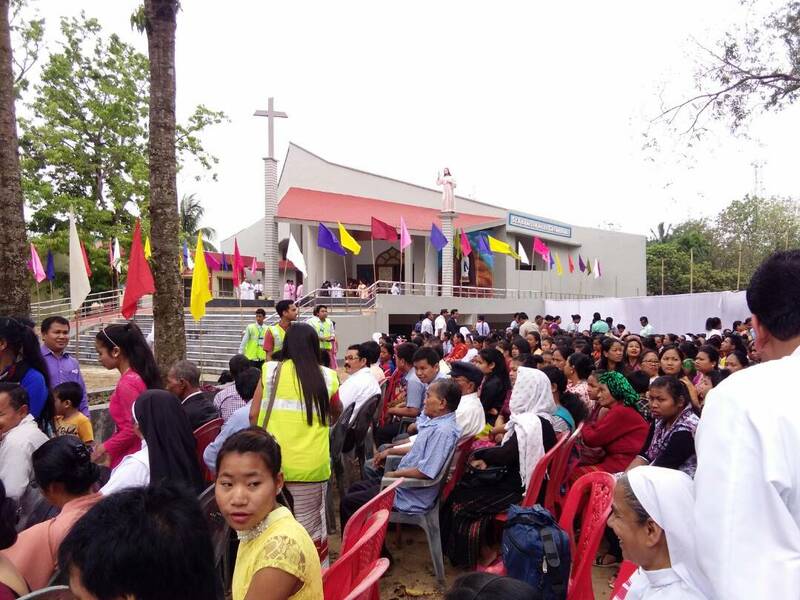 AGARTALA, 23 April, 2017: The newly built Catholic Cathedral of St Francis Xavier was blessed and dedicated today at Durjoynagar, Agartala in the presence of a large gathering of faithful and Church dignitaries. His Eminence, Cardinal Patrick D’Rosario CSC, DD, the Archbishop of Dhaka and the president of the Catholic Bishops Conference of Bangladesh blessed and dedicated the newly built Cathedral. He was joined by 10 other Bishops from different parts of Northeast India and also Delhi. Over five thousand faithful from all parts of the State took part in the sacred ceremonies. At the start of the day’s programs, the congregation was instructed about the nature of a Cathedral. A Cathedral is the center of the life of the local Church. From the Cathedral the Bishop teaches, sanctifies, and guides the people of God, the church. For the Diocese of Agartala which comprises the entire state of Tripura, the newly blessed Cathedral is a symbol of the unity of the Church and the responsibility of the Bishop as the head of the local Church, to oversee and safeguard the life of the Catholic people of the Diocese. Young people in traditional attire danced and welcomed the Cardinal and the Bishops to the entrance of the Cathedral. 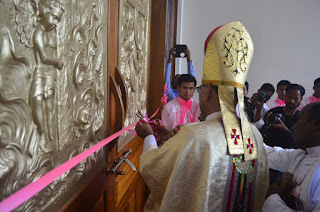 The inaugural function at the entrance consisted of cutting the ribbon by Bishop Lumen and the blessing and dedication of the Cathedral, the altar, and every other part of the edifice by the Chief celebrant, Cardinal D’Rosario. 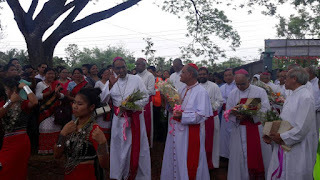 Bishop Lumen was joined on this festive occasion by his colleague Bishops from the dioceses of Shillong, Guwahati, Tura, Miao, Itanangar, Aizwal, and Delhi. Archbishop Emeritus Thomas Menamparampil was also present. Cardinal D’Rosario presided over the Holy Mass that followed and Archbishop Dominic Jala of Shillong, delivered the Homily. He dwelt on the four pillars on which the edifice of Christian faith stands – the Word of God, listening to the Apostles who preach the Word, the breaking of the Bread and Prayer. In the short felicitation that followed the Mass, the Cardinal congratulated Bishop Lumen for building such a beautiful Cathedral and also for realizing in the Diocese what the Cathedral stands for: unity of all faithful, irrespective of differences in ethnic and cultural differences. The chief contractors were also felicitated. Mr Paul Darlong, on behalf of the laity congratulated Bishop Monteiro. The five thousand people who gathered for the occasion from all parts of the diocese dispersed after a sumptuous meal. The Diocese of Agartala came into existence in 1996, when the state of Tripura was bifurcated from the erstwhile diocese of Silchar, of which it was until then, a part. On 26 May the same year Holy Cross priest Lumen Monteiro was raised to the order of Bishop and given charge of the new Diocese.